Throughout the world, the thought of wine country instigates images of rolling, symmetrically etched, and vine-covered hills. 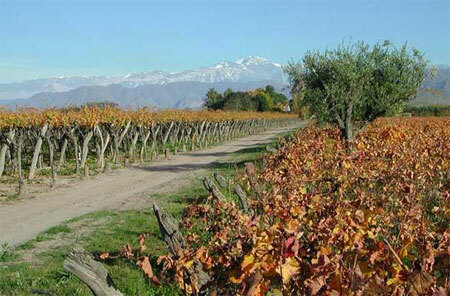 Argentine wine country, however, is actually situated on elevated desert planes of Mendoza province. While this wine region is not its preconceived notion, it is still a beautiful landscape that produces world-class wine. For the amount of foreign investment into the vineyards of Maipu, the town is surprisingly untouched outside of the bodegas. There are no hotels or tour offices, simply a sandy Argentine town used as an avenue for tourism brought from the city of Mendoza to the Bodegas. A bus tour from Mendoza is an efficient and informative way to see the vineyards. They enable the viewing of barrels and vines, and most include “free” sampling or appetizers. It is an easy day trip, usually in the early afternoon. Of course, wine is more than just vineyards, and that the wine country that enables the wine-swirling and sipping deserves much notice. Personally, I recommend renting a bicycle to tour the wineries in Mendoza. It is the best way to indulge in the scenery and culture of the wine region at an easy-going pace. Beginning at the cross of Garabaldi and Rioja, take the public bus with a large number 10, as well as a small number 171, 172, or 173. Inform the driver that you are planning on renting bicycles from Hugo. The ride takes you twenty minutes through outer Mendoza. The stops allow time notice the sleeping dogs, and children playing soccer. The density of buildings dwindles as you reach the outskirts of Maipu. Hugo is a gray man with contentment written across his face and belly. He seems to enjoy his new bike rental business and easily elicits smiles from his visitors. A bicycle costs twenty pesos a day, and you can pick whichever you find most comfortable. The complimentary bottle of water and map are perfect parting gifts. Maipu is a series of two cross roads featuring gas stations, kiosks, and a couple of restaurants operated out of homes and serving pollo y papas (chicken and potatoes). There are no sidewalks or bike paths. Being absolutely consciousn of the traffic is important. Most vehicles are not sneaky, but there are no speed limits posted. The road leads past fields of dirt with wooden posts in formation, expressing a hope for the bearing of fruit in the coming season. The sun is hot, but broken by trees on some of the roads. Before you approach the desired bodega, you will notice the Andes mountains. In the distance, ascending from the heat and earth, are the Andes mountains. They have recently received another coat of white wash in their early summer elevation. If they were missed upon arrival to Mendoza, this is the ideal area to first view them. They exude a satisfying chill, like a glass of ice water after mowing a mid-summer lawn. Peddling on, you arrive at sweeping views of vineyards accompanying the Andes in an adoring scene. There are about six bodegas in the immediate area. Touring the wine country on Sunday will limit the options. The differences between these bodegas are as marked as those in the wine they produce. There are family bodegas that were born with the town, and newly sponsored bodegas in their infancy. All provide tours, at prices between free and ten pesos. 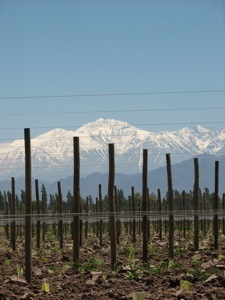 The Mendoza vineyard tours are interesting but not lengthy. They tend to quickly cover all information involved in the bodega’s process from a glance of the fields to a seat in the sampling room. Bodegas both new and old portray beauty and an incommunicable passion. The tours are informal. Some are more a conversation than an educational monologue. Be sure to take care on the bike after you visit to a few of bodegas! You don’t want to finish your great wine tour with a scraped knee. And don’t worry too much about the bikes – Hugo shrugs off broken kickstands and flat tires. Once you’re back in Maipu, walk half a block away from town and wait. A bus will eventually swing by to take you come for a well-deserved shower and late afternoon siesta. This page rendered in 0.813 seconds.